I grew up in the hills of Carrajung Lower, number six of nine children. Carrajung Lower is south of Traralgon, although I probably spent more time in Yarram. Yarram is 64 kms south of Traralgon. I attended Carrajung Lower primary school then two years and Yarram High School. I can’t say that I have always had a love of old cars, but buses were a key factor in my life. My father started a school run with a tray truck with a tarp over it in 1945. Eventually my older brother took over the Lawler Bus Lines which consisted of two buses, now his son run the bus lines which consists of three school buses and a coach. I began driving for my brother at the age of 24. My first car was an FJ Holden, hindsight is a wonderful thing, if only I had kept it. I drove Holdens for many years then Valiants. I met Anna who became my second wife and we purchased a school bus in 1994, servicing the Hedley area. We owned and operated the bus for eleven years before selling and retiring. Retirement? What’s that? I am almost 77 years old and still driving a bus full time. Anyway, owning a classic car was the last thing I thought I would have. I had always admired them, but own one? 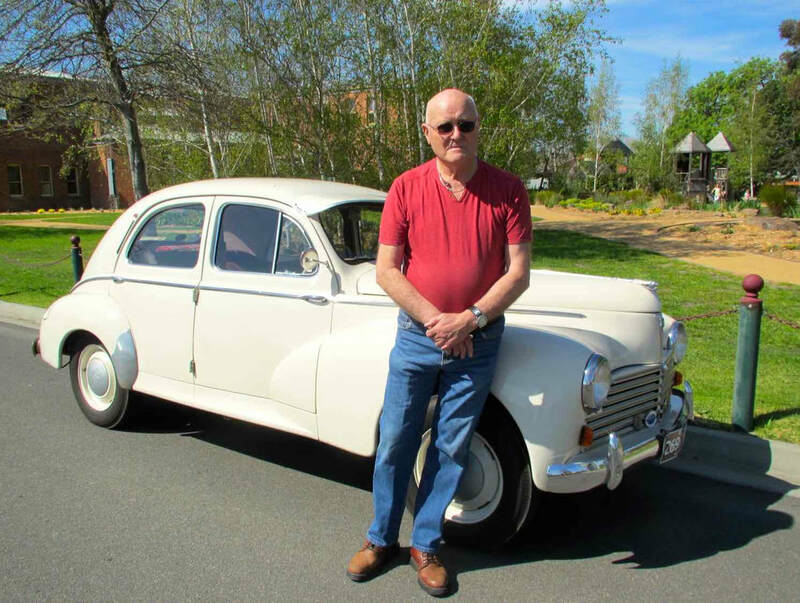 In 2013 a friend of ours who owns a 1954 FJ Holden asked us if we would like to go on an RACV Fly the Flag tour with him. We left the Yarra Valley for Shepparton, Wagga Wagga, Wodonga and Mansfield for an eight day tour, 205 cars in the tour, beautifully restored and some as they were in their original condition when were bought. By the time we got home the hunt was on for a car of our own. We spoke to a few people about looking for a car, then one Saturday morning our daughter-in-law’s mother rang and said there was a car for sale in her son’s garage, where he operates his business from. A 1954 Holden that had been in the front window for goodness knows how long, the owner of the garage had died and his wife was selling his estate. So a friend and neighbour, Ian, and I went and had a look at the car. This Holden turned out to be a 1957 203C Peugeot and I instantly fell in love with her. It belonged to a plumber from Welshpool who bought it new from the Yarram Motor Garage, owned by Leo McGlead. It was eventually traded in for a later model, and this Peugeot sat in the garage’s window for almost forty years. Leo had many offers to buy the car, but would never sell it. So Ian and I inspected the car and Ian said make an offer, you can’t go wrong. So I did and after a bit of a haggle with the price, I got it. A few weeks later I said to Anna I better go and do something with this car, so I drove around there and a friend turned up about the same time and between Jack, Mick and myself we got the car going after 5-10 mins. Mick is my daughter-in-law’s brother and operates the business from the garage. Mick drove it around the back of the garage and said “Well we better hose it down and see what you have bought”. I snuck home with the car, hoping no one would notice, as it still had the original number plates, GSB600, not registered of course which are now hanging with pride on my garage wall. The car had done only 48,000 miles. I eventually started working on the car, pulling all the interior out, the leather seats were in perfect condition except for some small tears on the back of the front seat, a good clean with leather cleaner and they came up a treat. The carpet was replaced with a close match to the original carpet in the back and the rubber matting on the front floor came up good with a good clean. My nephew helped me pull the brakes out and they were completely overhauled. My great nephews operate the Yarram Tyre Store in Yarram and ordered four new tyres to replace the ones on the car, which I might add were two different sizes. ​Other than put blinkers on the car and seat belts in the front, new rubber seals around the doors, grease and oil change and a cut and polish, we were ready for the road. We became members of the Maffra Shed (GVC) and registered the car with club plates. We also joined the Peugeot Club and are the envy of all the members, as quite a number of the members had tried to buy the car. The Peugeot Club have been very good, with members who have been able to get oil filters and gaskets, gear linkages and also globes etc. We have done three RACV tours in our PUG and she hasn’t let us down yet. 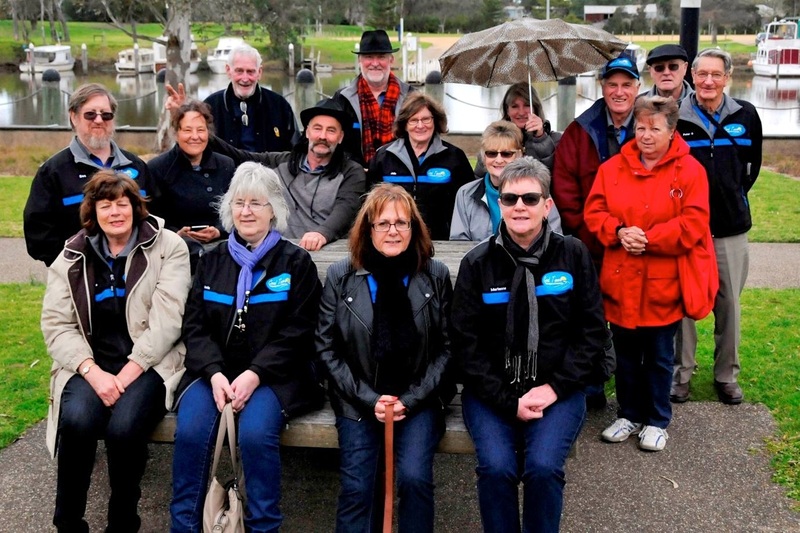 In March 2015, Anna and I helped to start "Good Times Motoring Club of Yarram". Anna was nominated secretary along with Bob, President, Peter, Vice President and Garry as Treasurer. We have so much fun with an outing once a month, made such great friends through the club. We are astounded at the number of cars around the area. Good Times is so aptly named, as that is what it is all about….’Good Times’. Membership fees are $50 per year and we currently have 55 financial members. Must have a car, motorbike or truck that is over 25 years old. Photo below: Alan is the one standing behind the lady in the red jacket on the right side of the photo, standing in between two guys with the black cap on and with sunglasses.